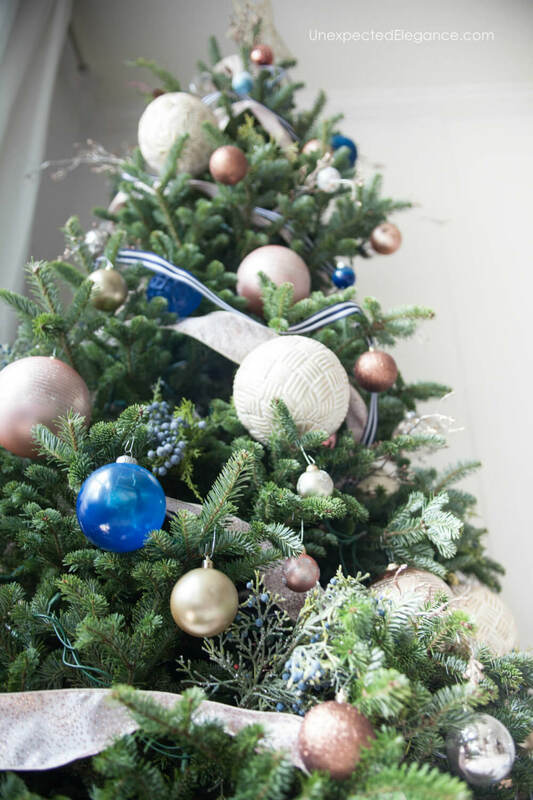 Need a specific colored ornament for your tree this year, but having trouble finding the right ones? 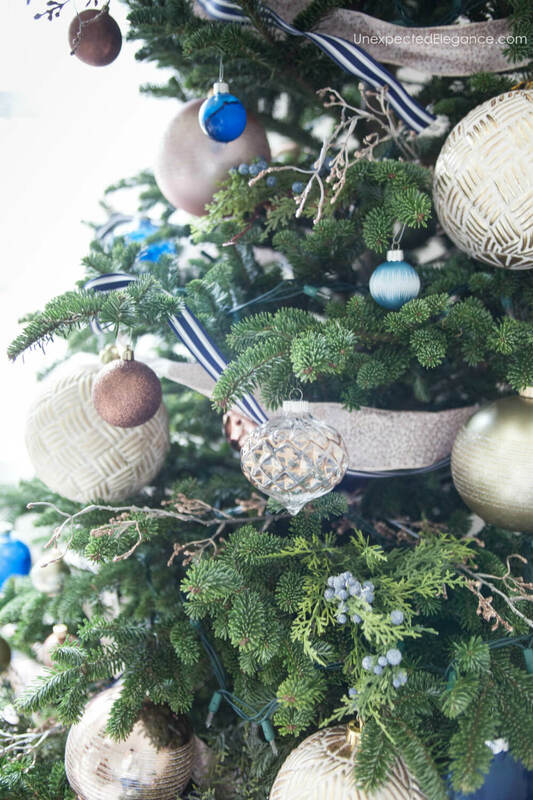 Find out how to make these DIY custom colored ornaments! We still have our traditional tree in the living room, but it isn’t near a window…and I wanted it to be visible from the street. There’s something so pretty about seeing the silhouette of a lit up Christmas tree as you pass a house. The tree is right behind our dining table, so I wanted to make sure all the ornaments were shatterproof. There’s always a chance of someone forgetting it’s there and hitting it! 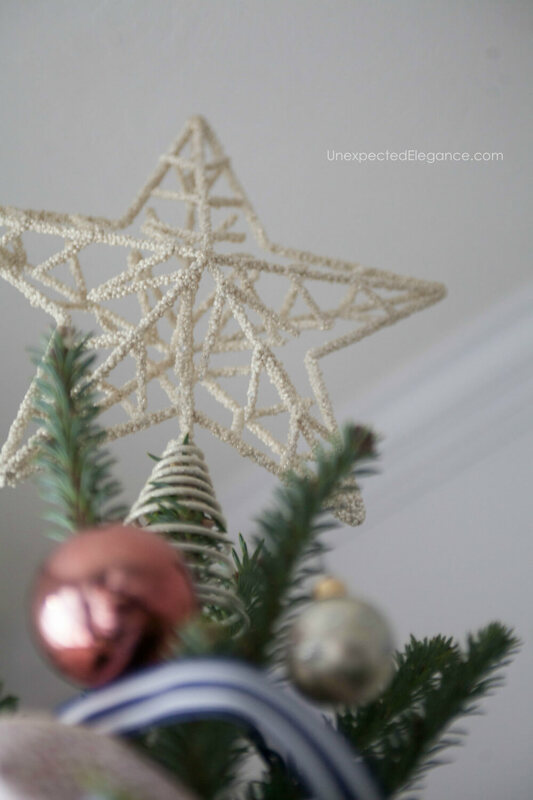 This year I partnered with JOANN for my dining room Christmas tree and I found a great selection of beautiful ornaments that won’t shatter into a million pieces if knocked-off the tree. They are perfect if you have small kids, pets, or just a not-so-careful adult in your house! 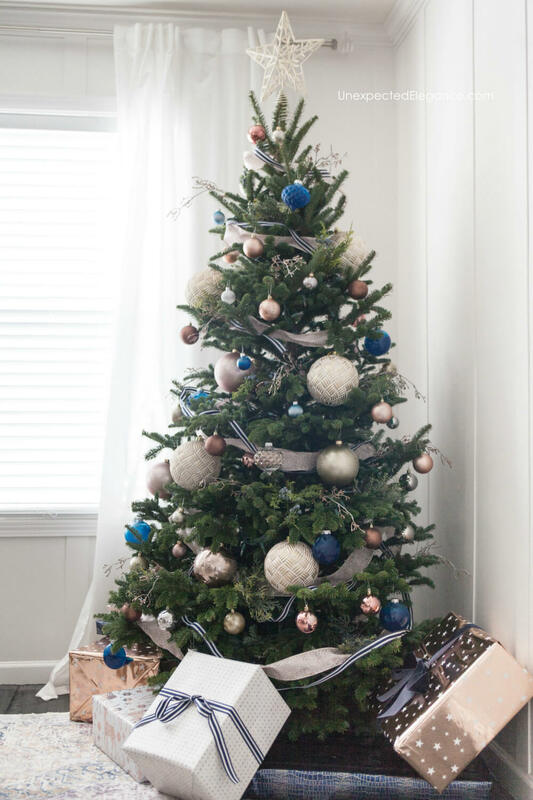 To decorate, I started by wrapping the tree in two kinds of ribbons. 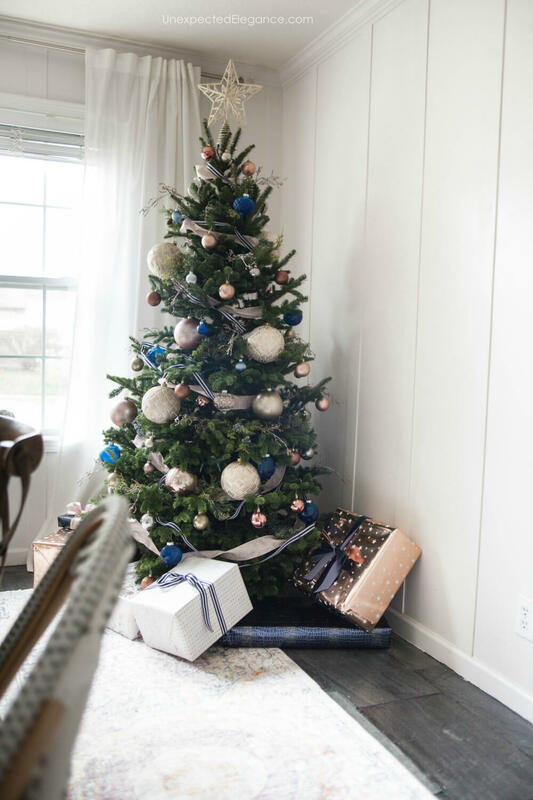 I started with the rose-colored ornaments and wanted to add in some pops of navy. I had some trouble finding simple blue ones, so I decided to just create my own. Using a box and some styrofoam as a base, I poked old pencils into the styrofoam to hold the ornaments as I painted them. I removed the metal hooks from each ornament and put the bulbs upside down on the pencils. 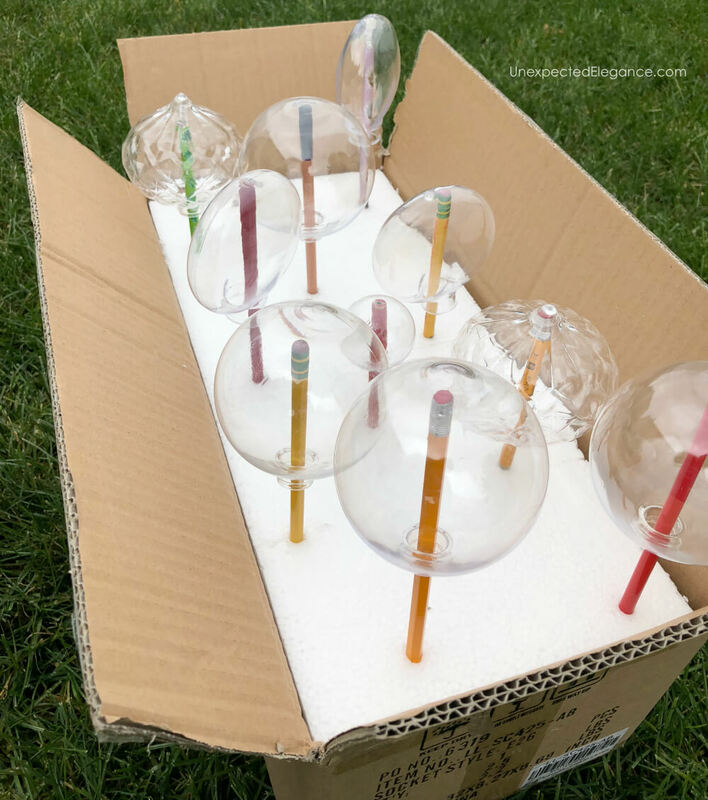 This method made it super easy to spray paint them and keep them from rolling around. I left a few of them clear and embellished them and a few of the rose ones with a gold paint pen. I drew super simple designs that only took a minute to create, but the extra details are so pretty! To fill in the tree a little more, I stuck some gold colored twigs and berry bushes throughout the tree. I love the extra pops of blue that the berries add. Finally, to finish it off, I found this beautiful tree topper, star from Joann. 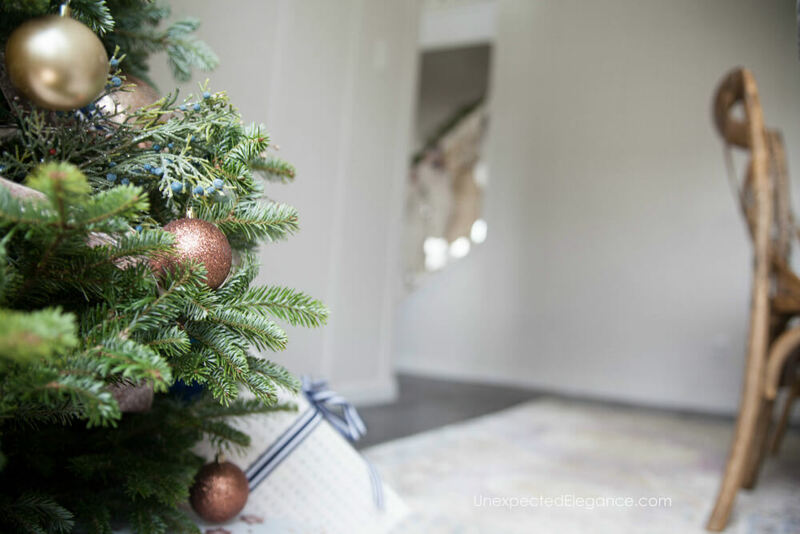 To see more of my home decorated for Christmas, check out this post HERE. JoAnn’s is a great resource. You used pretty colors. Love these! Super thank you gifts for anyone! Thinking can use as a bow on top of packages too! Thanks for chance to win today! Thanks for the chance to win the gift card from JoAnn’s. I love the look of the tree! The ornaments look beautiful but also like they would be easy to make. 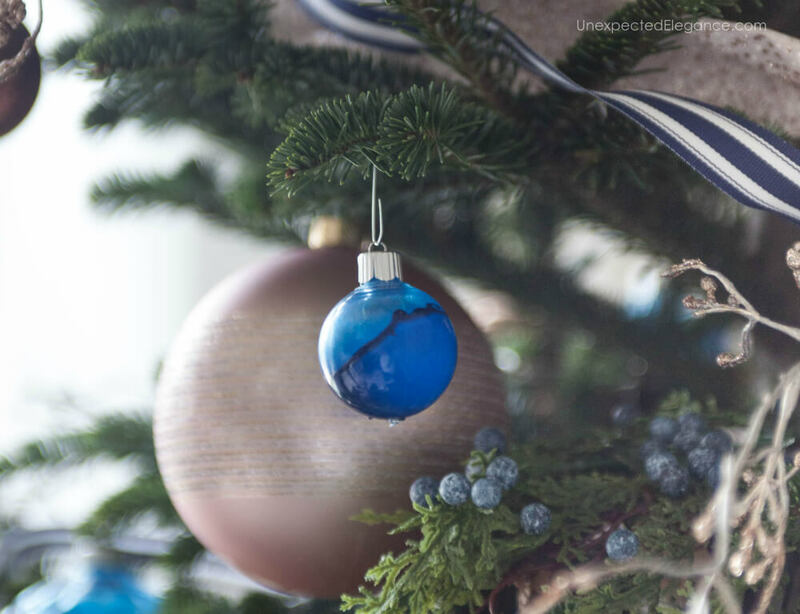 What a bonus to have shatterproof ornaments (especially with kids, dogs and cats around). I saved the idea to Pinterest. This is a beautiful tree! I love the subtle colors! Lovely tree! What a great idea to customize the colors! 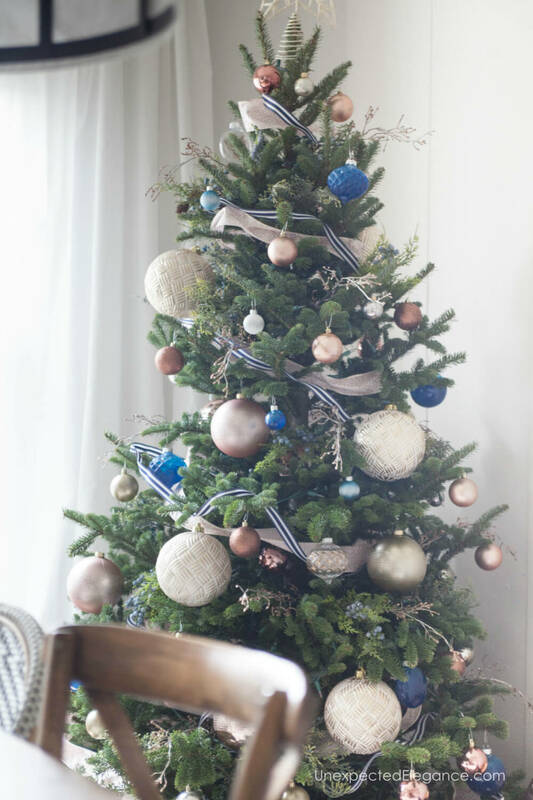 I am not a crafty person, but this looks like a lot of fun and your tree is beautiful! So pretty, I love the color choices! Will look so festive from the street, too. Nice job! Shared to my FB page. Oh, my! 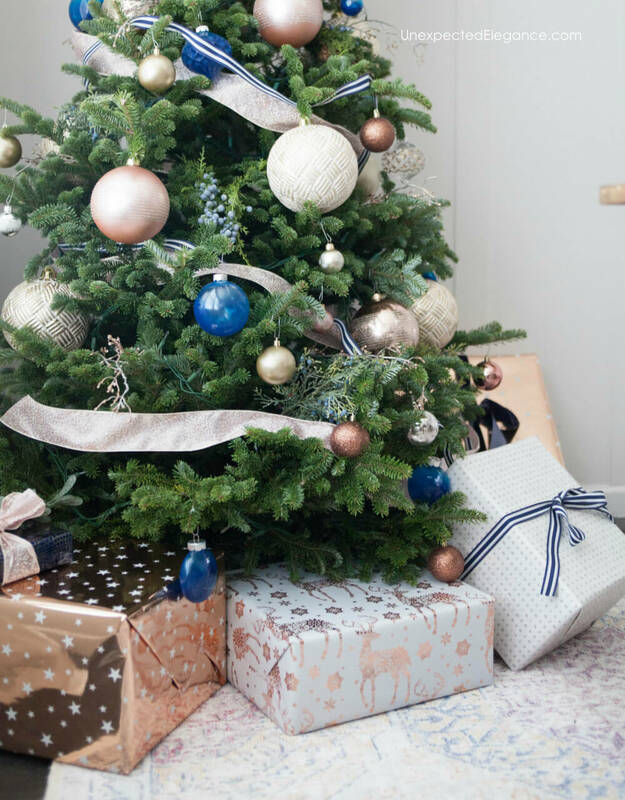 Your beautiful, full tree is magical! I, like you, put my tree by the window so it can be seen from outside!! You know what they say about great minds!! 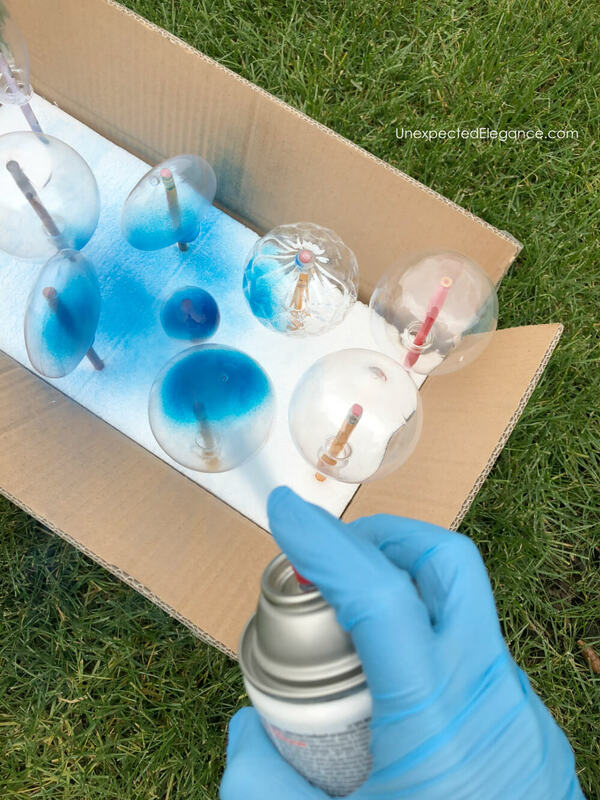 Your blue ornaments intrigue me and I was terribly impressed with how you spray painted them! I would never thought of it! 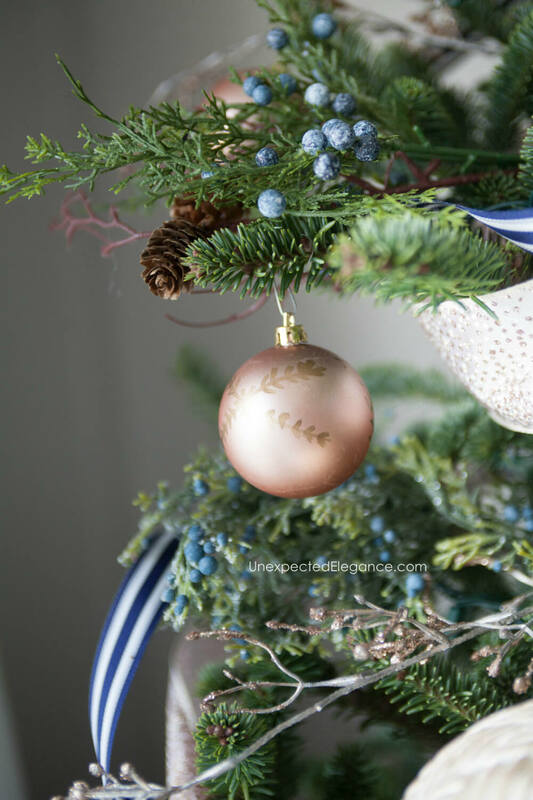 The blue berry twigs are very unusual and they add a lovely dimension to your tree! Thanks for such a fun post and I shall return!! Your pencil tip for painting the clear bulbs is awesome! What a gorgeous tree! I, too, put a tree in my dining room window so that it shows through the front window. I want to use these ideas next year for that tree. Thanks for the drawing! So very pretty . 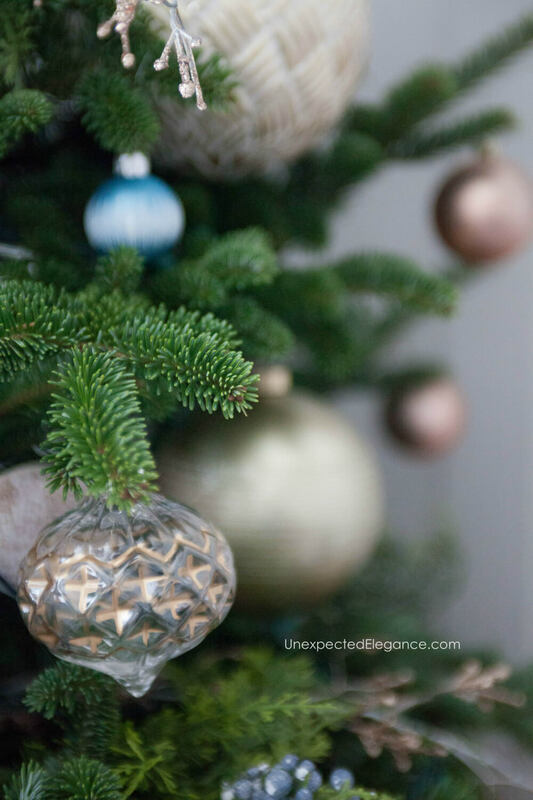 I like the idea of making the ornaments.i think it can be a fun family time. Thank you for doing a give away. Good luck everyone.